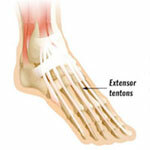 One of the most common causes of gradual onset pain on top of the foot is extensor tendonitis. Sudden onset or acute pain on top of the foot might be a sprain of one of the many ligaments connecting the foot bones, or even a fracture. If you have severe pain or swelling and are unable to complete normal daily tasks more than three days after injury, then it is advisable to seek professional medical advice. Or if there is any change in sensation in the foot, for example, numbness, or pins and needles then also seek medical advice. If you have rested and applied the PRICE principles (protection, rest, ice, compression, and elevation) for two weeks or more and still have pain or weakness, then also seek professional advice. Extensor tendinitis is inflammation of the extensor tendons which run along the top of the foot and straighten the toes and is brought on by overuse. Symptoms include pain over the top of the foot, which will have occurred gradually over time rather than from a single traumatic incident. The patient might complain of an aching pain on top of the foot which is made worse with running and improves with rest. There may also be swelling or redness over the top of the foot. The cause is usually overuse, particularly if the athlete wears poorly fitting shoes which are too tight across the middle of the foot. Treatment involves rest, application of cold therapy during the acute stage to reduce pain, and inflammation followed by a full rehabilitation program, which should include stretching and strengthening exercises. Read more on Extensor tendonitis. 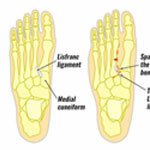 Lisfranc injury is a dislocation or fracture in the midfoot area, and if missed can have serious long-term implications. 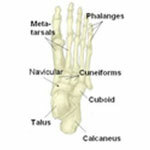 It occurs in the middle of the foot at the joint where the short metatarsal bones meet the long bones in the foot. Symptoms include pain in the midfoot area with difficulty putting any weight on the foot, and in particular, difficulty going up onto the toes. There may be some bone deformity visible but not always. Swelling is likely on the top of the foot and there will be tenderness over the joint area. If you suspect a Lisfranc injury or even a midtarsal joint sprain, then seek medical advice immediately. Delaying treatment of Lisfranc injury can cause long-term or permanent damage to the foot. A doctor will X-ray the foot in a weight-bearing position. However, this injury is often missed even with an x-ray, so if the therapist suspects Lisfranc injury and it is not obvious through X-ray then MRI or bone scan is required to confirm the diagnosis. A midtarsal joint sprain is an injury or tear to the any of the ligaments holding the midtarsal bones together. The symptoms and severity of a midtarsal joint sprain will depend on which ligaments have been sprained. Pain will be felt on the outside middle of the foot and there may be swelling on the outside and/or top of the foot. Certain movements will trigger pain but the precise location of the pain will depend on which ligaments are injured. The two most commonly injured ligaments are the calcaneocuboid ligament on the top of the foot (connects the Calcaneus and the Cuboid), and the Bifurcate ligament (a Y shaped ligament). Treatment will mean immobilization in a cast for up to six weeks and/or surgery to pin the bones together. This injury is rare but can occur in gymnasts, footballers, and jumpers. With any midfoot sprain or fracture, it is important to consider a Lisfrancs injury which can have serious long-term implications if missed. 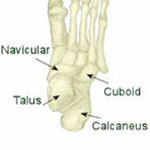 A navicular stress fracture is a hairline fracture of one of the tarsal bones called the Navicular. It is one of the most common stress fractures affecting athletes, especially those in explosive sprinting and jumping type sports. Symptoms include a poorly localized ache in the midfoot area which gets worse with exercise. Pain may radiate along the inside arch of the foot and pressing into the top of the foot over the Navicular bone itself (called the N spot) and will be painful and tender. Treatment of a navicular stress fracture depends on how severe the injury is. If the injury is classed as a ‘stress reaction’, where the outer part of the bone has not fractured then weight bearing rest in a walking splint may be recommended until symptoms have gone. If a stress fracture is diagnosed then complete non-weight-bearing in a full cast for a period of 6 weeks is needed. If after 6 weeks the ‘N’ spot is still tender then the cast is re-applied for a further 2 weeks non-weight-bearing. Read more on Navicular stress fracture. Morton’s neuroma or Morton’s syndrome occurs when a nerve becomes trapped between the third and fourth toes causing pain, numbness, and a tingling sensation over the top of the forefoot. Pain is made worse by weight-bearing, particularly up onto the toes and can also be reproduced by squeezing the forefoot to further compress the nerve. Morton’s neuroma can be caused by wearing ill-fitting shoes which press against the nerve, as well as activities which involve spinning on the ball of the foot, such as golfers and tennis players. Treatment involves reducing pain and inflammation through rest, applying cold therapy, and inserting padding under the forefoot in order to spread the metatarsal bones, therefore decreasing the compression of the nerve. A doctor may prescribe anti-inflammatory medication and any biomechanical problems of the foot, such as overpronation should be corrected.